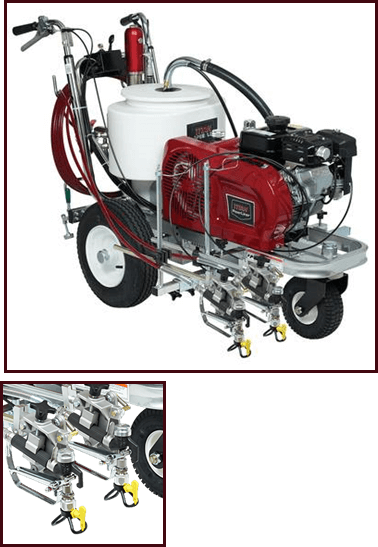 The POWRLINER ™ 850 is designed for small jobs, athletic and personal lawn maintenance managers who need a line or basic markup, capable of high pressure spraying for smaller works on the pavement, grass or grass. Recommended for smaller works on the pavement, grass or grass. Simple and compact design weighs only 31 Kg. -Easy to use, transport and store. Requires only one operator and fits easily in most cars. Equipped with LX-40 gun, 1908 (4 "pattern) TIP and 15 m. airless hose. Designed to carry a bucket of paint of 19 l..
Removable gun for placement of signs and painting. MAX. FLOW. 1,25 l / min. ANCHO DE LÍNEA RANGO 2 "-12" 5 – 6,25 cm. MAX. HOSE LENGTH 15 m.
COMMON applications for light duty use stripes in parking lots and athletic fields. The POWRLINER ™ 2850 It is designed to withstand constant use, every day on the floor, fields and lawn. It is the perfect middle line that can handle all the projects with a gun and nozzle performance better than other similar equipment. Fluid section piston and slower cycle rate, with greater capacity for living longer. Higher production and longer use held in a design that weighs only 72 Kg. easy to use, transport and store. Versatile gun support, It can be placed to spray at left, or right, front of or behind the stripe. Medium sized projects, Ideal for athletic fields, or flooring; easy maneuverability of rotation and placement of signs fast and easy. 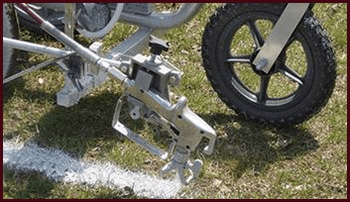 Perfect for contractors who need a maneuverable team, medium crosshatch, line for projects where large machines are not profitable to operate. 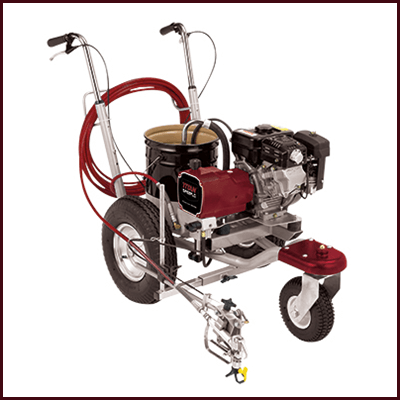 A Motor-powered Subaru ® 126cc OH very reliable and easy start-up. MAX. LINEAR SPEED SPRAY 126,8 (m) per minute approx..
MAX. HOSE LENGTH 90 m.
Designed and built for contractors who are serious about complete lines mapping projects means large scale quickly and cost-effectively. PowrLiner 4950 It is the first step in hydraulic strippers where power and long-term, the operation of high strength are the difference between a business that makes money and one that does not. 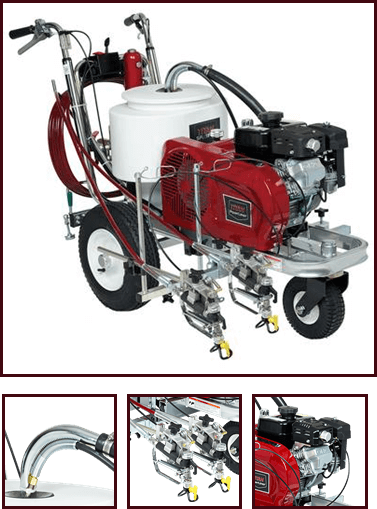 Versatile gun bracket can be placed and spray at left, right, ahead or behind the machine. MAX. SPRAYING SPEED 155 m / min. Larger projects require more power and output. 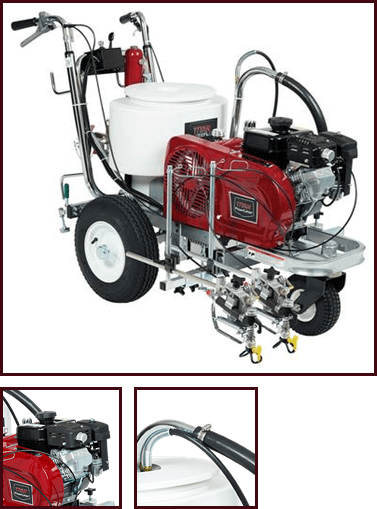 PowrLiner 6950 It is the workhorse of the industry, designed for ease of use and simple operation on large projects that require maximum performance with minimal downtime and maintenance time. Powered by a reliable 211cc Subaru ® with oil alert. MAX. SPRAYING SPEED 210 m / min. For larger projects that require more power and flow. PowrLiner 8950 It is the right machine for the industry, designed for ease of use and simple operation on large projects that require maximum performance with minimal downtime and maintenance time. Powered by robust Subaru ® 211cc with oil alert. Electric start for easy operation. MAX. SPRAYING SPEED 229 m / min. Rough surfaces for painting equipment.